As a young squirt I was made to read The Hobbit in my English class at the age of about 9. I found it fascinating and it lead me into the Lord of the Rings and many other sci-fi and fantasy books. 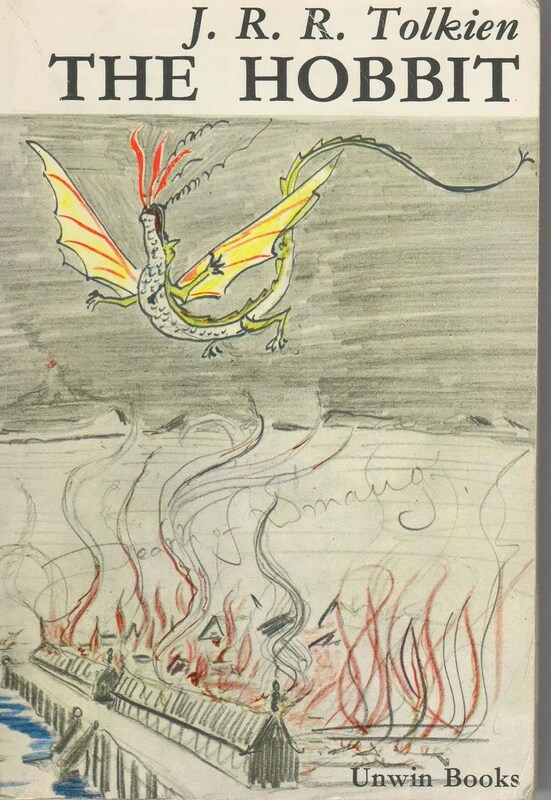 The image is Tolkein’s depiction of the death of Smaug above Lake Town, a rarer cover version of the book. The first part of the film is ok, and close to the book. The portrayal of Beorn is a bit disappointing (goblin heads on posts! ), Mirkwood is ok though I really missed Bilbo taunting the Spiders (Attercop, Attercop…) and one can even accept the Wood Elves being more aggressive under a much more fleshed out character in the King Thranduil. 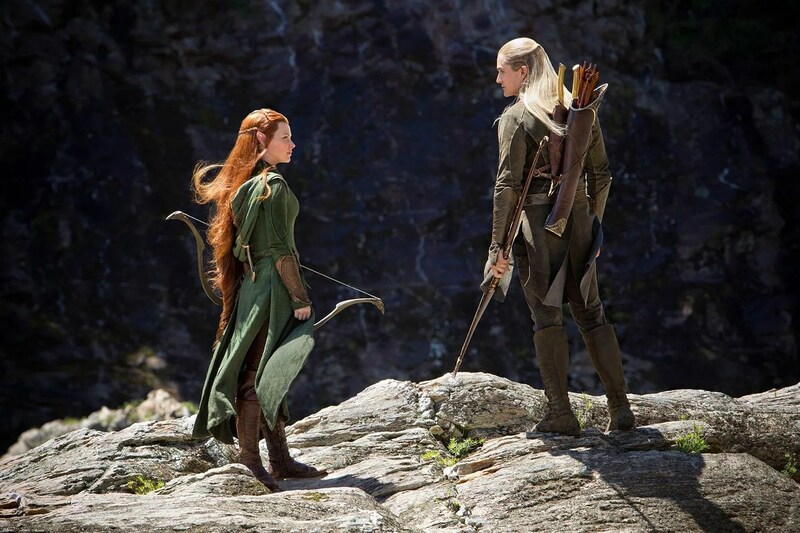 The inclusion of Legolas and Tauriel was ok, Tauriels flirtation with Kili a bit unlikely but not a show stopper. It also helps the continuation with LOTR WRT Legolas and is in keeping with the deeper background of Tolkein’s works. The escape from the Woof Elf Kingdom is a bit OTT but not wildly so, the involvement of the Orcs is in terms of a filmatic theme ok. Laketown itself is well done and The Master (Stephen Fry) is well done and better fleshed out than in the original book. The background of Bard in Lake town was good, and his link with his ancestor Girion, Lord of Dale. I liked Bilbo’s encounter with Smaug. It wasn’t as passive as in the book, but this is a film so that is forgiven. It may have been too long and his finding of the Arkenstone a bit too premature – I guess I’ll hold fire on that until the third film. 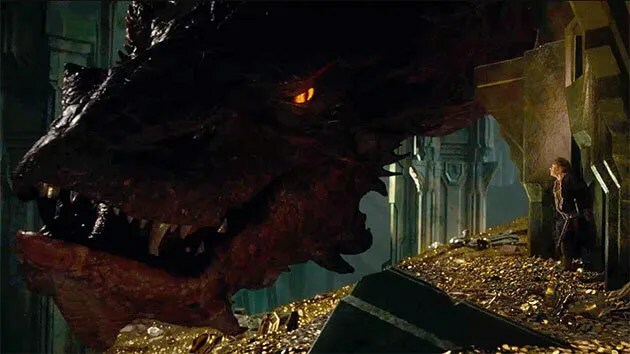 Smaug is portrayed excellently, a half lizard half cat like capricious creature, and the voice of Benedict Cumberbatch captures the spirit of this evil creature well. 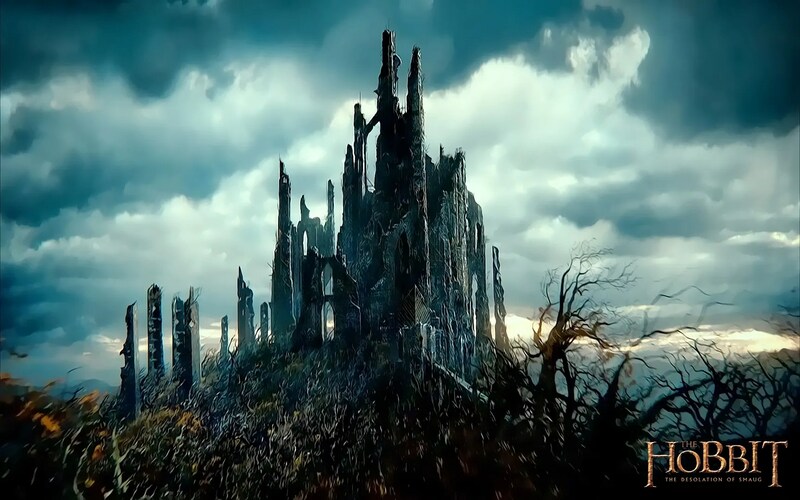 The inclusion of Dol Guldur and the rise of the Necomancer aka Sauron, is perfectly in keeping with the original book’s narrative and I don’t have a problem with it. In fact Jackson et al by knitting together Tolkein’s references from all his books makes it a much wider narrative and much more enjoyable. At this point it all starts falling apart. For some as yet unknown reason (the pretext being Kili’s injury and some shoehorning in of Tauriel and Legolas), four of the Dwarves are left back in Laketown. Totally out of kilter with the book. There had better be a good reason in the 3rd film. The attack of the Orcs under Bolg is well done cinematically, but again nothing to do with the book, nor even Tolkein’s wider plot. The Lonely mountain should have been approached over dismal swamps, but it isn’t, just lots of icey foot hills. Where are the burnt out fir tree woods the Dwarfs sang about on the first film ? The Dwarfs descend into the mountain way too soon and get caught up in a very boring stereotypical CGI chase scene with Smaug, and launch a wholly implausible attack on Smaug from which he survives, makes an implausible deduction and randomly flies off to torch Laketown. Thorin goes off the deepend with gold lust way too early, and this is only rescued by Balin’s reaction. Most of the other Dwarfs remain ciphers which could have been fleshed out during this unnecessary set of scenes instead. Why not stick to the original book ? That would have had more than enough opportunity for Smaug to come out of the mountain track down and chase the Dwarves, toast some ponies and then fly off to Laketown in revenge. It misses out the Thrush mostly and probably the Ravens. As a film, its good, but as an adaptation of a book its disappointing. There are way too many loose ends, odd plots and digressions to make it satisfying for Tolkein fans. A strange mish mash of the enjoyable and the “eh what ?”. Just been to see The Hobbit: An Unexpected Journey and having seen the reviews was a bit wary of what was being served up. Luckily the film is IMHO good (as was the Mexican food we had afterwards). As had been widely anticipated, the film is more than just the material in the original book, and contains a lot of material culled from various appendices from LOTR, and other Tolkein sources. Are these extra bits approrpiate, useful, enjoyable ? Answer is: Yes. Many of them are referenced in The Hobbit as single one liners or throw away comments that do demand more explanation for viewers who haven’t read all the main Tolkien works, or are not bothered with foot notes etc. Its still a long film. My reaction and that of my friends was that some of the action scenes were too long and could have been trimmed back. Some of the critics have moaned it was slow starting. That’s true to an extent, but there’s a lot of back story to tell, and if you read The Hobbit’s first chapter it is fairly portrayed in the film as well. As in, no action ! There have been many complaints about the 48FPS making people feel sick, neither I nor my friends found this a problem, and the HD did not look like it was a made for TV movie at all. (NB: We didn’t see the 3D version) The CGI was very good with only a couple of scenes where it was noticeably not quite up to the mark. 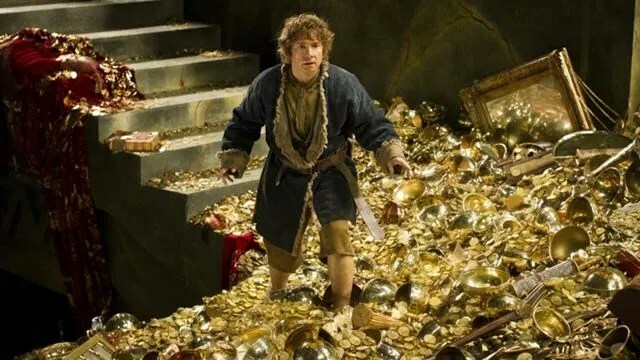 Martin Freeman as Bilbo was excellent, and Andy Serkis as Gollum was off his trolley, I hope they have more of Gollum in the next two films showing how he was captured by Aragorn, and the escaped from the Wood Elves. Talking of the next films, there’s a lot of complaints they’re milking the franchise. Probably yes, but (a) the film release schedule looks odd, as in the original two films planned for release one year apart, and now the third only 6 months later..huh ? (b) The use of additional material does help expand the Middle Earth history and I can see where its going with leading in to the LOTR films. Though I hope Peter Jackson does not then use this as an excuse to re-visit the LOTR films like George Lucas did with the Star Wars films (I mean Han shooting second ?). Having 12 Dwarves must have been a nightmare to even try and get any sense of individuality to any of them. The scripts did help to a great extent, with several of the dwarves standing out already. Bombur was the least used except for some visual gags. Still early days. 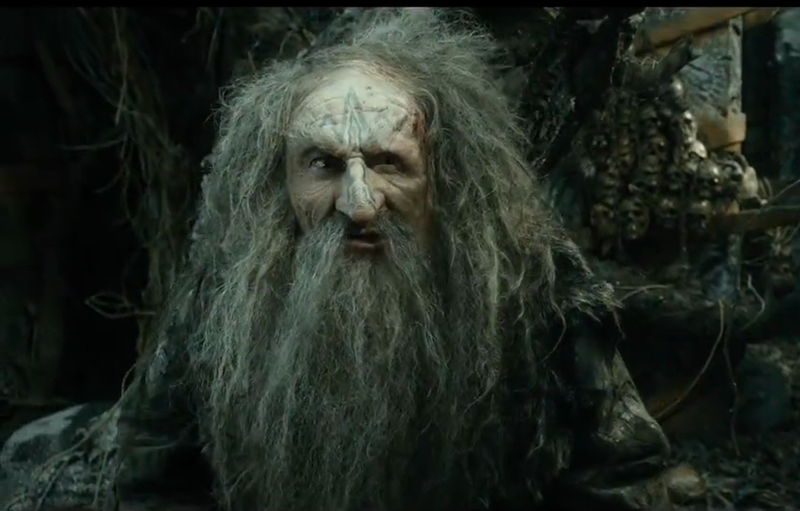 Thorin’s drive was apparent from the start of the film, as was his Elf-o-phobia (TM). The only down side was the actor (he was good at his job) sounded very much like Sean Bean as Boromir in both accent and grammer which was mildly annoying. The Wargs were much more wolf like than in LOTR TTT and less Hyaena like. The exact point where the film ended in comparison with the book was something we were speculating on and turned out to be a nice point in the film. The use of Rhadagast, Elrond, and Galadriel was well done. Now for all the Spoliers, so don’t read on if you don’t want it spoilt for you ! I really liked how they did Dale at the beginning of the film, along with Erebor itself. As expected, Smaug himself is not seen directly at any point in the film which was good, apart from at the end when you see one single eye. The beginning was slow but did not drag as I felt it was necessary exposition of the plot, much like was done at the beginning of FOTR. The encounter with the trolls comes soon enough, htough that is very different than in the book. Neither better nor worse I’d say overall, and helps bring out Bilbo’s braver side for the first time. Rhadagast is introduced early on too, and I was very very dubious about the trailer and what I had heard about him – he’s integral to the overall plot over the years but doesn’t intrude much into The Hobbit. However, the way he became a key part of the plot in introducing us to The Necromancer (Sauron returned) was very cleverly done. Not quite convinced by the sleigh idea but it was quite amusing. The foreboding about the Spiders was also cleverly inserted. His entry into Dol Guldur was clever (that’s not in the trailer, and conversely Gandalf’s visit is omitted, so either extra bonus DVD material or material from film 2 or 3?) and as commented before is a clear lead up to the full return of Sauron and the return to Mordor in time for the events in LOTR. The meeting of The White Council was good, ok it may well have been done to insert (!) Galadriel into the film, but it is part of the back story that they did meet to discuss the necromancer. I found Saruman a bit testy and clearly opposed to Gandalf in a too overt manner, they could have saved this souring of relations for the next films. That Gandalf didn’t show them the Morgul blade Rhadagst had retrieved from Dol Guldur was annoying (you muppet) and had to be prompted by Galadriel was annoying. Elrond’s deus ex machina was useful in starting to get the jigsaw puzzle put together. Using Azog the Orc as an adversary was also a neat idea. I wasn’t convinced at first, but a quick flick through The Hobbit before/whilst writing this review has made me think this is going to help hang the Orc/Goblin foes together as a coherent force for when they turn up in The Battle of The Five Armies (I’m guessing Azog and his son Bolg are conflated into one strong character). The wargs as commented are much better in this film. The Goblin King and goblins under the Misty Mountain were betetr than I’d expected too. However, the number of falling scenes at such great heights, and the over extended fight scenes were disappointing. Technically brilliant, plot wise a bit too much padding. And there’s no way anyone can fall some of those distances and not come out with broken bones. This was the most annoying part of the film to be honest, and the least believable (but hey we are talking goblins, dwarves hobbits and wizards). As stated Bilbo and Gollum’s encounter was a key point of the film and keyed it firmly into the LOTR style with the ring’s presence, and whilst sinister it was also quite funny. Thorin’s dislike of Bilbo continued to be a bit stronger than maybe needed, but then I guess this is going to be in keeping with his character which seems stronger than in the book. Bilbo’s rescue attempt when Azog’s minions are about to kill Thorin in the warg chase was a bit OTT, and surely one of the other stunties would have backed him up a bit quicker. The whole tree on the edge of a cliff was also a bit of a sledge hammer to crack a nut, and they could have kept with the fires burning the dwarves out of their perches as per the book. Still overall it worked well enough. The rescue by the Eagles was ok, the scene of reconciliation between Thorin and Bilbo on the eyrie was to be expected, and apart from Smaug’s short appearance was the end of the film and a surprisingly good point to end it. As per the LOTR films I found myself carefully listening to the dialogue to spot the chapter titles from the book (yeah I read it a couple of weeks back) and many are included in the film which is a nice touch, as is much of the dialogue. Not too many songs luckily. The re-use of much of the LOTR theme tunes was ok at first, but it did get a bit wearing and I hope they’ve commissioned more new music for the other films. There is a lot of effort put into the props and scenery. The different appearances of the Dwarves are not as per the book, but are good enough to differentiate them. James Nesbitt and Ken Stott (Bofur and Balin) are strong characters and the two most well disposed toward Bilbo. I’m looking forward to the next two films after this promising start. At nearly three hours long, do your safe a favour, and book VIP seats though !